Sewing and the quality of stitching were really admired…The artistry was truly appreciated. An awl is used to make starter holes through hide when sewing boat covers, clothing, and boots. Sewing tools were traditionally among a woman’s most prized processions and were often highly decorated. 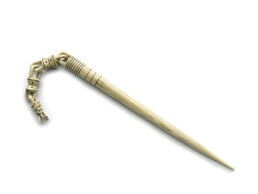 This ivory awl has a fancy carved chain with a seal’s tail on the end.